...and lived to tell the tale. Of all the horrifying skincare stories we've read and watched, this one might just take the cake. Because while it may not involve anything about beauty treatments gone wrong or adverse side effects from products used, it does involve something getting stuck in a place that you always want to keep clean and clear: your pores. Microbeads have developed a bad rap over the years due to the harmful effects they have on the environment and our skin. And Redditor Casual_Mongolian experienced just how bad they are for people—while washing his face with a scrub, one of the beads ended up INSIDE one of his pores! Yuuuuuck!!! "…so I bought an exfoliating face wash. Well one of those blue (plastic?) 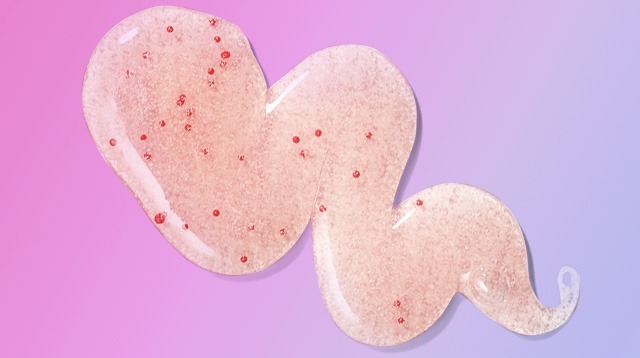 microbeads are stuck in a pore right on the surface of my skin. It's on my high cheek where I've never experienced any open acne so I'm not sure how it got in there... Regardless, it's not infected or anything right now and I'm not in any pain. I tried to poke it out with a sterilized needle, but it's such a tight squeeze I didn't want to rip up my skin trying to get behind it." Luckily, the people of Reddit jumped to his aid and suggested solutions like using a comedone extractor or just going to see his dermatologist. But the solution that ended up working was the classic ~hot-compress-and-Q-tips~ combo! He then updated the forum, saying, "What I ended up doing was warming my face with a hot wash rag first… What ended up doing the trick was two q-tips and a little bit of squeezing!" Congratulations, Casual_Mongolian! Glad you have that tiny piece of plastic out of your face!